From the acclaimed, best-selling memoirist and novelist—“a writer of rare talent” (Cheryl Strayed)—a memoir about the staggering family secret uncovered by a genealogy test: an exploration of the urgent ethical questions surrounding fertility treatments and DNA testing, and a profound inquiry of paternity, identity, and love. What makes us who we are? What combination of memory, history, biology, experience, and that ineffable thing called the soul defines us? In the spring of 2016, through a genealogy website to which she had whimsically submitted her DNA for analysis, Dani Shapiro received the stunning news that her father was not her biological father. She woke up one morning and her entire history--the life she had lived--crumbled beneath her. Inheritance is a book about secrets--secrets within families, kept out of shame or self-protectiveness; secrets we keep from one another in the name of love. It is the story of a woman's urgent quest to unlock the story of her own identity, a story that has been scrupulously hidden from her for more than fifty years, years she had spent writing brilliantly, and compulsively, on themes of identity and family history. It is a book about the extraordinary moment we live in--a moment in which science and technology have outpaced not only medical ethics but also the capacities of the human heart to contend with the consequences of what we discover. DANI SHAPIRO is the author of the memoirs Hourglass, Still Writing, Devotion, and Slow Motion and five novels including Black & White and Family History. Also an essayist and a journalist, Shapiro's short fiction, essays, and journalistic pieces have appeared in The New Yorker, Granta, Tin House, One Story, Elle, Vogue, O, The Oprah Magazine, The New York Times Book Review, the op-ed pages of the New York Times, and many other publications. She has taught in the writing programs at Columbia, NYU, the New School, and Wesleyan University; she is cofounder of the Sirenland Writers Conference in Positano, Italy. She lives with her family in Litchfield County, Connecticut. "Profound... 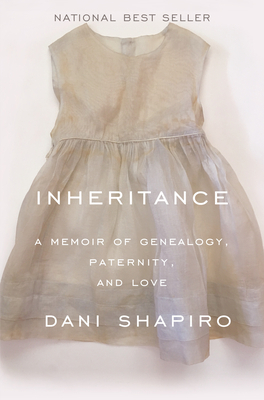 The true drama of Inheritance is not Shapiro’s discovery of her father’s identity but the meaning she makes of it...Shapiro’s account is beautifully written and deeply moving — it brought me to tears more than once." "Inheritance reads like an emotional detective story...Shapiro is skilled at spinning her personal explorations into narrative gold... Life has handed her rich material. But her books work not just because the situations she writes about are inherently dramatic and relatable. Her prose is clear and often lovely, and her searching questions are unfailingly intelligent... The relevance of Shapiro's latest memoir extends beyond her own personal experience. Inheritance broaches issues about the moral ramifications of genealogical surprises." "Poignant...Origin stories are among the most powerful that exist because they shape people’s identities and anchor them—to a culture, a place and other people. When stories about the past change, Ms. Shapiro argues, so does the future...In losing the genetic connection to the man who raised her, Ms. Shapiro gained new insight into their enduring bond." "A profound and exquisitely rendered exploration of identity and the true meaning of family." "Dani Shapiro can tell this story like no one else could... Smart, psychologically astute and not afraid to tell it like it is." "An incredible work of investigation and self-reflection... A thrilling and emotional ride... The story’s beating heart is Shapiro herself... Written with generosity and honesty, Inheritance takes the modern phenomenon of casual DNA testing and builds a deeply personal narrative around it. The result is a vital, necessary read from a talented author." "A remarkable, dogged, emotional journey... Inheritance reads like a mystery, unfolding minute by minute and day by day. The reader experiences the grief, surprises and setbacks right along with the author... Shapiro’s book is a wise and thorough examination of how this news affected her. She is a good guide for the bombshells that are yet to explode for so many families." "Inheritance will speak to anyone interested in identity, in family, in a story told with great insight and honesty and heart." "In Inheritance, Shapiro movingly reckons with identity and family secrets." "Fascinating... With thoughtful candor, [Shapiro] explores the ethical questions surrounding sperm donation, the consequences of DNA testing, and the emotional impact of having an uprooted religious and ethnic identity. This beautifully written, thought-provoking genealogical mystery will captivate readers from the very first pages." "For all the trauma that the discovery put her through, Shapiro recognizes that what she had experienced was 'a great story'—one that has inspired her best book." "Page after page, Shapiro displays adisarming honesty and an acute desire to know the unknowable."